When I needed to have portable win7 installation for my work at Luxoft, suitable running on my Xiaomi Mi Notebook Air, I decided to use KVM. Many benchmarks found in the web showed that it would be really good. However, it took a while to figure out usable deployment. The best manual I found in the Arch Wiki: QEMU. It’s detailed enough to go through it from end to end to decide what options would serve best. Thus, I ended up using virtio for most hardware and QXL for graphics. 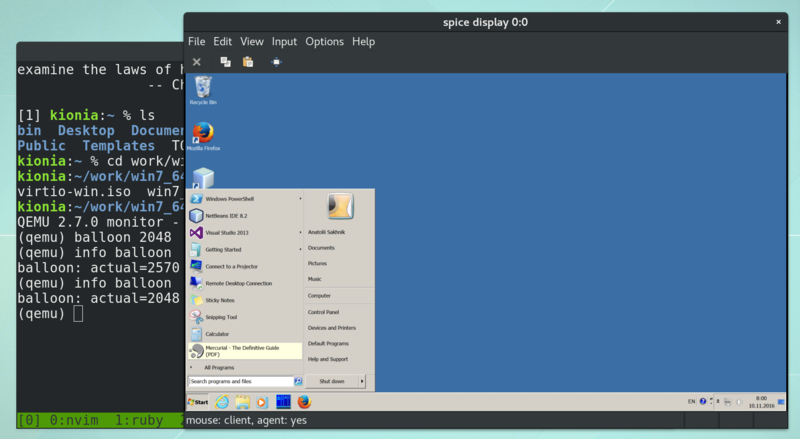 Finally, SPICE was what turned user experience into real pleasure with proper key grabbing, clipboard exchange etc. Without further ado, there is my launch script: win7_64. Random discoveries around programming, software development and life.